A woman has been arrested on suspicion of murder after a man was found with several stab injuries. 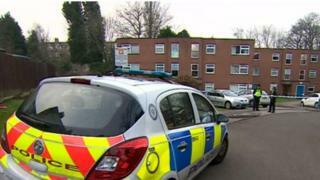 West Midlands Police were called to a block of flats at Frensham Way, in the Harborne area of Birmingham, just after 11:00 GMT. He is the third person to be stabbed to death in Birmingham within 10 days after teens Abdullah Muhammad and Mohammed Sidali. No details of the latest victim have been released. A force spokeswoman said: "Police have launched a murder investigation after a man was found with fatal injuries at a block of flats on Frensham Way in the Harborne area of Birmingham this morning. "Officers were called to the road just after 11am, where a man was found with several stab wounds. Sadly, he was pronounced dead at the scene. "A 26-year-old woman has been arrested on suspicion of murder as inquiries continue."